Sandra Bland: Is the bail system that kept her in prison unconstitutional? Why Was Sandra Bland Still in Jail? She couldn’t pay her bond. How a bail system the Justice Department has called unconstitutional may have contributed to her death. 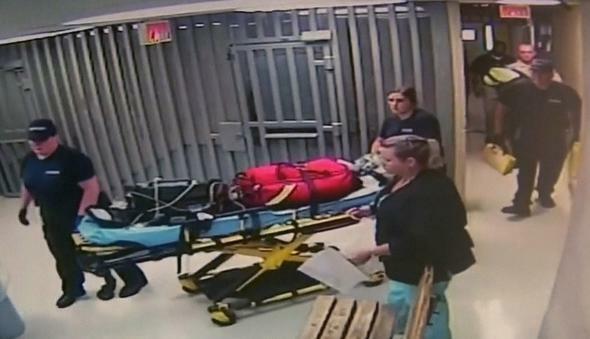 Medics leave with equipment on a stretcher at Waller County Jail in Hempstead, Texas on July 13, 2015, in this still image taken from video provided by the Waller County Sheriff’s Office, after Sandra Bland was reported dead in her jail cell following a routine traffic stop. A movement to change the bail system in the U.S. has been gaining momentum recently. During the past year, a civil rights organization called Equal Justice Under Law has been successfully pressuring small cities around the country to cease using cash bail, on the grounds that it is a violation of the 14th Amendment. If the bail system is harder on poor defendants than the well-to-do, the argument goes, then it is a violation of the Equal Protection Clause. To date, the two lawyers who started the organization, Alec Karakatsanis and Phil Telfeyan, have mounted cases against five cities in three states. Two of those cases—against Dothan, Alabama and Velda City, Missouri—have resulted in settlements that required the cities to stop charging people money for their freedom. The other three cities, according to Karakatsanis, have also agreed to stop using cash bail in response to being sued, and settlement negotiations are underway. The problem with fixed bail schedules, Schnacke added, is that they “keep low- and medium-risk people in jail who don’t have money,” while keeping high-risk people with money out of jail. Someone with money in the bank can walk free, even if their record indicates that they’re a high flight risk, while an indigent defendant has to stay locked up no matter what. In practice, Karakatsanis said, that’s pretty much how cash bail works everywhere, including in those jurisdictions where judges aren’t bound by a fee schedule. Washington D.C. is the rare jurisdiction (outside the federal courts) that has effectively abolished cash bail during the 1990s. In that city, roughly 15 percent of defendants are held on “preventive detention” because releasing them is considered too risky, but the remaining 85 percent are allowed to walk without paying anything, and the vast majority of defendants end up appearing in court like they’re supposed to. If Sandra Bland had been arrested in Washington, Karakatsanis said, it’s almost certain that she would have been released within hours.